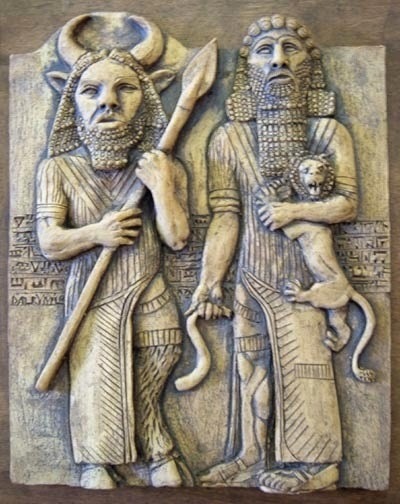 Gilgamesh of Uruk, great king and itinerant seeker, priest of Kullab and bosom-friend of Enkidu, we thought we knew ye. Well, we should have figured. The Epic of Gilgamesh, history’s first great narrative poem and mankind’s inaugural piece of literature, has (in modern times at least) always been a cobbled-together affair. The story we know today is the average, so to speak, of dozens of slightly varying versions, written over a period of about a thousand years or so, and unearthed from Akkadian, Assyrian, and Babylonian sites throughout the Middle East. Between the 1850s and 1930s the Gilgamesh tablets were collected, translated, and assimilated into the now familiar account of a melancholy king’s search for immortality. But there was always that chance that just one for fortuitous turn of the spade might amend the story. And yep, sure enough, that has happened. Archaeology and warfare have always been strange bedfellows, and this has surely been true throughout culturally rich Iraq. The tumultuous years since the 2003 U.S. invasion have seen countless sites and artifacts plundered and destroyed. Yet there have also been opportunities, doubtless impossible under Saddam’s regime, for the recovery of treasures which otherwise would have disappeared into private hoards. The Sulaymaniyah Museum in Iraqi Kurdistan, for example, has been privately negotiating with smugglers, and buying back loot before it could spirited out of the country. 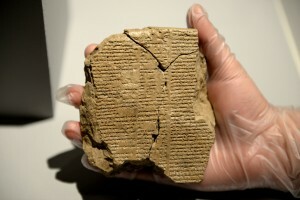 In 2011, for the bargain-basement price of $800, the museum purchased this clay tablet. A cursory translation revealed it to be part of the Gilgamesh story, a familiar “chapter” about Gilgamesh and his friend, the wild-man Enkidu, battling the god-monster Humbaba in the Forest of Cedar. The tablet was placed on display, with a short description card describing the story fragment and the language it’s written in. This entry was posted in New Post and tagged culture, Epic of Gilgamesh, Iraq, literature. Bookmark the permalink.